Dried fruit is enjoyed far and wide throughout Thailand as a snack, but until now we've been unimpressed with the final quality of anything that's packaged and exported. Inevitably the flavor, color and overall characteristic of dried Thai fruit has been disappointing. 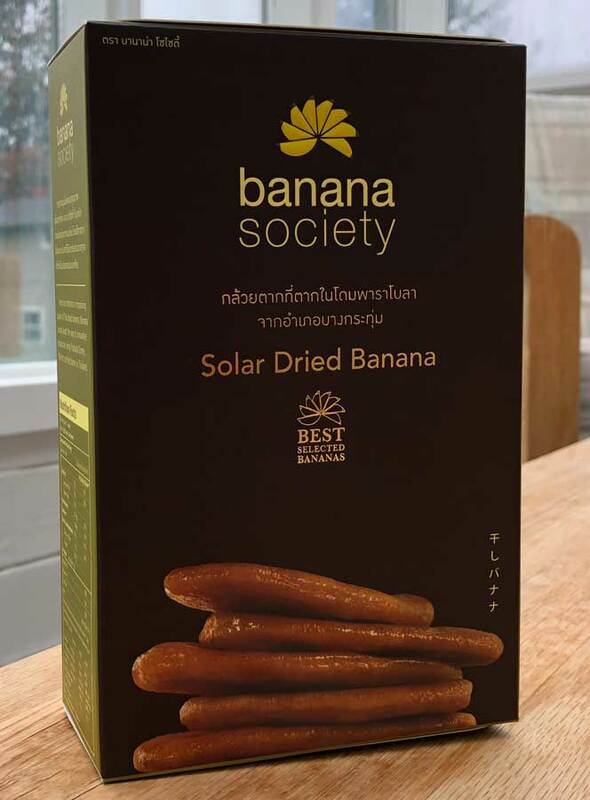 We found these dried Thai bananas at a local wholesaler and they became an instant top seller among local Thai, Lao and Vietnamese who snap up as fast as they can be put on the shelf! These dried bananas are a guaranteed hit if you love the true banana flavor of the sweet mini banana variety. As you can see from the pictures, they're a golden caramel color. We always have new stock so they're nice and fresh, and although dried they are soft and chewy not hard and brittle. In Thai they are the "Kluay Nam Wah" variety which is short, fat and sweeter than other varieties. Kluay nam wah are also well-known as being a good source of nutrition for young children, and they won't upset a baby's stomache. Our own family devours these. One case has 25 packages, each package contains one banana which is gently pressed and sun dried, with no artificial flavors or preservatives or added ingredients. The price may seem high for a snack, but this is a healthy snack, and it takes 6 or 8 pounds of fresh bananas to come up with 1 lb dried. Ingredients: Banana 100% all natural. Product of Thailand.